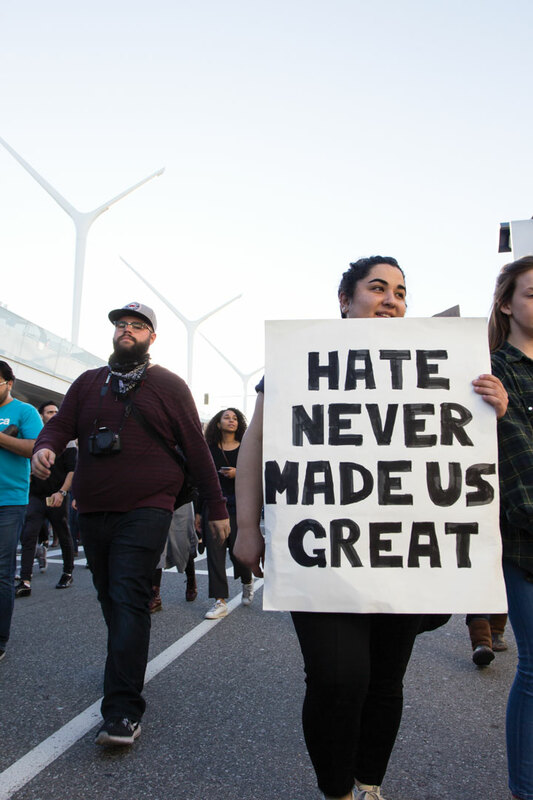 About half a dozen students from California Baptist University joined thousands of protesters at the Los Angeles International Airport Jan. 28-29 to protest the executive order signed by President Donald J. Trump. Somalia, Sudan, Libya and Yemen–for 90 days. Refugees have also been barred for 120 days and refugees from Syria, in particular, have been barred from entering indefinitely. The order, effective immediately, created a commotion as legal visa holders landed in the United States only to be sent back onto airplanes. Kevin Chen, sophomore criminal justice major, said he showed up to the protest because he is a dual citizen and has lived in an international community. He said a Syrian father shared his story of coming to America with his son for surgery, but now he was stuck –unable to go home to his wife in Syria and unable to leave his son in America. “The stroke of a pen is dangerous, and these orders need to at least come with a process afterward,” Chen said. Paul Olson, senior business administration major, also participated in the protest. However, not all students at CBU are in opposition of the ban. Nolan Falconeri, junior criminal justice major, said he was in support of the travel ban that was signed. Initially, the ban affected not only legal visa holders but also green-card holders, but the White House has sinced eased some of these restrictions. According to State Department figures, an estimated 60,000 visas were provisionally revoked as a result of the ban. Dr. Chris McHorney, chair of the Department of History and Government, said that although the president has some constitutional authority over immigration policy, that authority is not unlimited in scope. Reflecting on the history of protests in the United States., McHorney noted that protests have had good outcomes similar to the Civil Rights Movement, however, there have been unsuccessful protests as well, such as most anti-war movements. Judge James Robart, a federal judge from Seattle, issued a temporary restraining order Feb. 3, temporarily stopping the ban from being carried out nationwide.